When they say, “very fluid,” they mean it! These paints move and blend so wonderfully over paper. Just like the rest of the distress products, these are reactive with water. But once they’re dry on your medium the water will no longer react with the paint making the layering possibilities endless with mixed media and art! Also when they’re dry there’s no texture; It’s a very smooth finish unlike other acrylic paints. The paints really absorb into the medium you’re working with. The colors are vibrant, rich and consistent. There is a small ball in each bottle to make sure that the paints gets properly mixed, so make sure to give it a good shake before using. The dabber dispenser works well and the bottle has a gently give to it when you really want to get the paint flowing. The dabber sponge stays nice and moist as well. I accidentally left my black soot open in the studio all night and was worried I ruined it when I returned to the bottle in the morning. Not so! It was still juicy and ready to use again right away! It’s also good to note that the clear caps that come with the dabber do not screw on, they just pull off. So don’t go unscrewing the cap, then go to paint and squeeze your bottle. That would be bad. And messy. And don’t ask me how I know that. Some of you might wonder what the difference is between the distress paints, the distress paints, inks, etc… that Ranger offers. 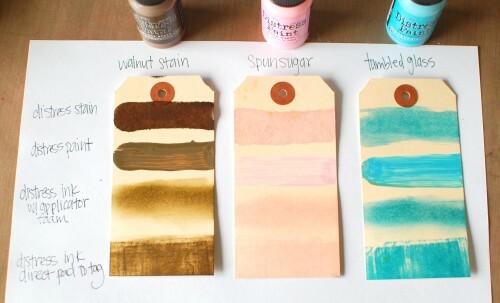 Here are a few tags I tried out three different colors on to give you a mix of how the different mediums work. These are not to be confused with the Ranger Adirondack paint dabbers. These are completely different formulas. The distress paints are more fluid and while both are reactive to water, even once dry the adirondack paints will continue to react with water whereas the distress paints will be permanent and unaffected. 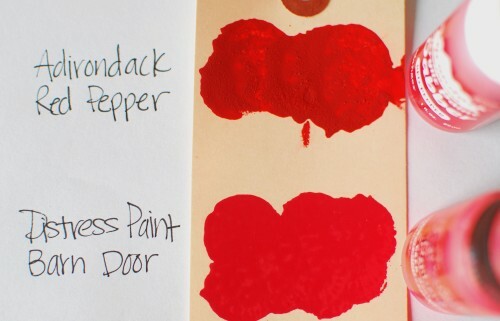 The adirondack paints have a bit of a “tooth” or texture to them once dry as well. In the tag below you can see where I dabbed some Red Pepper adirondack on top and the distress paint in barn door on the bottom. The distress paint is more consistent in color and smooth to the touch where the adirondack has more of the standard acrylic quality we’re used to. You can see here that you can dilute the paints to get your desired shade of color. I dabbed one dab of barn door on my craft picked up paint with my water brush and swiped it, then spritzed the paint on my mat and repeated. The more water you add, the thinner the paint gets and you get more of a watercolor effect. Going on with some samples, here’s a swatch with a dab of distress paint on different mediums. You can see that the paint is very opaque and covers many different surfaces well. I also tried stamping it with foam stamps and an acrylic stamp. The paint works well even with the fine detail of the acrylic stamp. With these tags I dabbed the distress paint directly onto the stamps. You can also play around and spritz the stamp with water before or after stamping to get a fun distressed effect. There are three new metallic distress paints out and they are fabulous! Talk about a truly rich metallic colors! Since distress paints are so fluid they sink beautifully down into metal stamped tags! I was surprised to see how bright they stayed on ribbon and trims, too! With this tag, I dabbed a couple of different colors close to each other on a craft mat (a very handy tool when working with these paints) and spritzed it with water. I took a circular foam stamp and dabbed it into the paint on my craft mat then onto the tag. When it was dry I couldn’t help but add the doodle circles. One last little experiment I wanted to try was to letterpress with the distress paints. I took the raised side of an embossing folder, dabbed a few colors of paint on my mat and gently brayered it on. I ran it through my Vagabond using letterpress paper and it worked! You can choose to spray water on your paints before you brayer it on; this allows you to spray afterward and give it a blurry kind of dreamy look. If you just use straight paint, you have to work fairly fast. Some of you might be concerned about actually “painting” with these! Don’t be! You can easily unscrew the dabber top and dip your paint brush in or use an ink palette. Just don’t use a palette with concave reservoirs or you won’t be able to hit the little trigger within the dabber that opens and allows the paint flow out. You can also dab some paint straight onto a craft mat and pick it up with a paintbrush or waterbrush. You get quite a bit of paint with each dab; a little goes a long way! I think we covered the basics! I fell in love with the swiping technique in the video I took of Tim at the last CHA. I had to try it myself a few dozen times! I picked one tag that I really liked and die-cut a butterfly into the bottom of it and added it to a page in my Dylusions Art Journal. I also used the distress paints to do the splatter paint background, stamped foam and acrylic stamps, added some watercolor detail and even painted some tiny attacher staples and let them dry completely before attaching them to my tag. One fun technique we played with at Ranger U was putting some paint onto a foam applicator and gently swiping it across an embossed tag. I first distress inked it then squished some stickles into the crevices of the honeycomb embossed tag. Then I swiped the distress paint over the top of the tag and let it dry. I cut the tag in half and carefully cut out some of the extra honeycombs. I decided to make a fun card using some Lawn Fawn stamps I had from a previous review. I stamped the background flowers in distress paint and colored the little bees using distress paints and a waterbrush. The flowers behind the sentiment were die-cut from a brown bag, dabbed with distress paint and then spritzed heavily with water and dried with a heat-it tool. Well crafters, I have to say I love these paints. The way they work with water and then dry permanently is absolutely amazing to me. My journal and distress paints haven’t left my studio table in weeks; I have had so much experimenting and playing with them. Distress paints come in 27 colors from the distress palette and includes the three new metallic colors. Each bottles contain one ounce of paint are approximately $4.99 a bottle. You can purchase them at multiple online retailers and some larger retail stores like Hobby Lobby. I suggest picking a few colors you’re really drawn to start with. 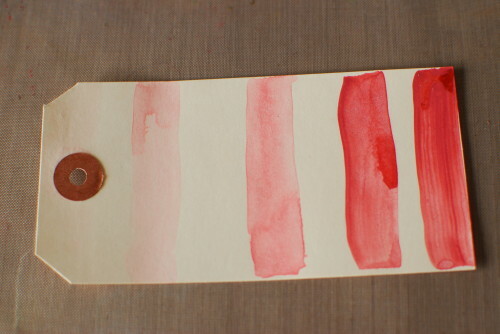 I’ve been really drawn to the brighter colors of the distress paints whereas I’m usually drawn to the shabbier colors! Well, what do you think crafters? As always, let me know your thoughts, questions and opinions! What do I think? Well, it looks like you have had so much fun with these incredible distress paints that I am going to have to give them a try.You’ve created some breathtaking projects! I love the results of the swiping technique. Love your review! I’ll definitely be referring back to it until I can keep all the differences straight! And the bees are adorable! I love that embossed honeycomb. Is that Tim’s? Great review- these are on my wish list! He produces great products. I love every single one I own…Thanks. What a fantastic review! I live these paints but I haven’t done half if what you have with them. You have inspired me! Love your demo! Very informative and easy to follow. I am a certified scrapbook instructor for Michaels. Hi Georgia! Yes, the honeycomb embossing folder is one of Tim’s designs with Sizzix. It comes with a distress dot folder as well! Thanks for stopping by! Thanks for an excellent review and instructions. I havnt tried them yet but will be….soon. Looking forward trying this out. awesome , these are such great products , really love them. [ especially after some bad experience with the normal paint dabber ] thanks for this great tutorial , you saved me a lot of work while a was planning to do simmiliar tests as you did ,have a nice day, greetings from lotte. Thanks so much for doing this review!! It was just what I was looking for to help me decide whether or not to get these 🙂 They are just what I need! Thanks for the review–really helpful! Coming to this a bit late. Do you have to wash the dabber parts in soap and water between use? A few years ago I had a Ranger dabber product and discovered the hard way that if you did not thoroughly wash it, the acrylic paint would dry in the spongy dabber and turn hard. Thank you! Where did you get that cute circular foam stamp? I love it! Thanks! That’s not a stamp- it’s an impression from the dauber itself. Jenny, I’m totally confused. The photo shows a tiny acrylic-mounted foam thingy next to the tag with the doodles. And it says “circular foam stamp” in the post. 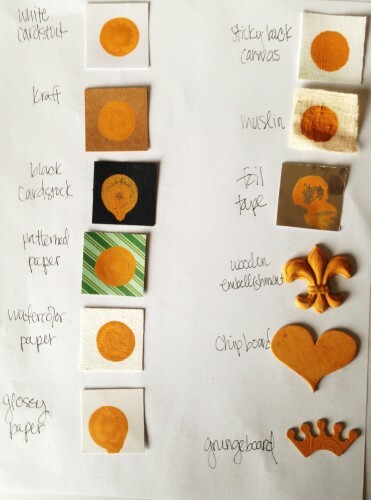 ” I took a circular foam stamp and dabbed it into the paint on my craft mat then onto the tag. When it was dry I couldn’t help but add the doodle circles.” Thanks! Sandra, the foam stamp I used is from an older Lisa Bearnson Kit of the Month set I purchased about a decade ago. I’m sure you could DIY one by layering and glueing layers of circular foam to a thick piece of plastic. (Like a leftover pastry box) Or look for a foam stamp set for flowers, they usually include circles for the center of the flower. Hope this helps!